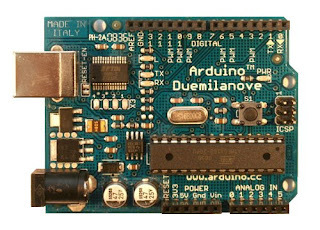 Recently I acquired an Arduino Duemilanove. I realize a lot of you probably think I'm coming to the party a bit late but I'm an embedded systems developer by profession and I have all sorts of code snippets for various micros, in-circuit programmers, etc. In short, I've just never had a need to pay extra for a board with a bootloader and software libraries. A new project came up and it's a "one off" that didn't really justify a custom circuit board, etc. I was searching for reasonable priced boards that used the Atmel AVR processors and was reminded of the Arduinos while looking through the Sparkfun Electronics web site. If you ignore for a moment that they are the Arduino design and have their bootloader the fact is several of these boards are less than $18US in single quantities! They use either the Atmel AVR ATMega168 (16K) or ATMega328 (32K) micro so they are fairly capable in bare form at a price that's hard to beat. When my board arrived I decided to have a look at the Arduino software and programming environment. I have to say there are some nice looking features and my plan right now is to try things out by using it for this current project. One more thing that's very cool about Arduino... not only is the development environment, compiler, etc. freely available but it is available in Windows, Linux, and Macintosh formats so you can easily program on your computing platform of choice. I will report more observations as things progress. I love to read. Mostly about technical subjects but frequently about the exploits of others who do what I consider to be really cool things. One such guy is Steve Roberts. He once spent a few years of his life building an outrageous, high tech bicycle called BEHEMOTH then rode it around the country. 17,000 miles of riding. He's on to building a high tech microship now. This week I got a copy of Steve's book Reaching Escape Velocity. So far it's a great read but it's not about technology per se. It's about how to launch gonzo engineering projects with the help of sponsors, volunteers, and a little help. Details of the book are here along with order info. The Winlink Testing mentioned in an earlier post was a success. Over a two day period the only two stations that appeared in my "heard" list were KA9VAU and KA9STB. Both were far enough away that it had to be a VHF band opening and not potential interference. I will make an announcement in all the usual places but by the end of the month N9PUZ-10 and N9PUZ-3 will move to 145.610 MHz. Around noon local time on September 18 I switched the N9PUZ-10 RMS Packet gateway to a frequency of 145.610 MHz. That's the designated ARES digital frequency for Illinois. I'll be leaving it there through the weekend to monitor for any other heard traffic and to give anyone who cares to listen a chance to monitor for beacon messages, etc. I anticipate moving the gateway and the N9PUZ-3 (alias SPI) packet digipeater to 145.610 MHz by the end of the month unless some unforeseen problem comes up. Work is slow but steady on the new, revamped web site. You can get a peak at the new N9PUZ now. 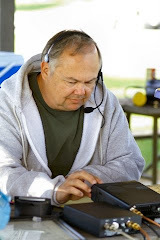 It was a ham radio weekend here. On Saturday I went to do a site survey in Carlinville, Illinois. I'm helping the club down there set up a VHF Winlink 2000 Gateway similar to N9PUZ-10 that I operte in Springfield. The Illinois ARES organization has an initiative to make Winlink 2000 available in each of the State's 102 counties and we're trying to do our part. Sunday was the Capitol City Century bike ride. My home club, the Sangamon Valley Radio Club always coordinates APRS trackers and phone operators for SAG vehicles, rest stops, etc. I'm in the process of making some updates to my main web site. It's going to undergo some much needed reorganization and I'm moving it to a different host. The new site will be hosted at www.hams4u.com/n9puz. My old domain name and web site are still active at www.n9puz.com and once the changes are a little further along that domain name will be pointing to the new site. Thanks for all the reader support! The first Monday of each month, September 7th this September, is the monthly ARS Spartan Sprint. The sprints are short, fun QRP contests. It is a contest but these are really friendly operators. They'll go as slow as you need them too and don't be surprised if you get a short rag chew when you meet someone new. Only two hours. Lots of fun.